With about 200 different species scattered worldwide, gardeners probably know fewer of these flowers than any other popular group. It's all because of the intense interest in just a few of the species, for centuries. Today, of course, everything is dominated by our oversized, “bigger is better” passion for the tall Bearded Iris, also called German Iris (Iris germanica) . Anyone who studies Greek mythology learns that Iris is the name of the Goddess of the Rainbow, surely one of the best assignments on Olympus. And because of the great elegance of the iris bloom, it has been the symbol of monarchs and royal families throughout history. In fact, one of the earliest known artworks of an iris is a fresco in King Minos' palace on the Greek Island of Crete. The palace dates from 2100 BC. Of course, the most famous royal use of the iris as a symbol of power and position was that of the Bourbon Kings of France, including Louis XIV. The iris was adapted on royal banners as the “Fleur de Lys”, the elegant, three-sectioned symbol that disappeared from the French flag with their Revolution, but is still quite common in the decorative arts. In fact, today it still proudly adorns the beautiful flag of the French-founded Province of Quebec in Canada. 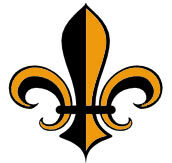 The famous "Fleur de Lys" is an ancient graphic representation of the Iris bloom. It was used as the symbol of French royalty for centuries. Great Britain also borrowed the motif. Edward III added the iris to his royal coat of arms during the 14th Century. And a famous painting of Elizabeth I shows her in a gown embroidered with irises. Irises also have a medicinal history, the roots being used in preparation for medicines for skin infections, syphillis, dropsy and stomach problems. Today, it is still a drug widely used to purge the liver. The iris has probably second place as the favored flower in great art. After the rose which is surely No. 1, irises appear in paintings by Leonardo daVinci, Durer, Renoir, Cezanne, van Gogh, (whose famous painting “Irises” set an all-time auction price in recent years, selling for over 53 million dollars), Gauguin, and of course, Claude Monet. Bearded Irises have been popular forever, and no wonder. They are very easy to grow, and, especially in recent years, put on one of the truly great flower shows in the garden. Bearded Iris bloom is in “late spring,” after the tulips and daffodils, and often with oriental poppies and peonies. There are six official classifications of Bearded Irises, based mostly on their heights, but the one everyone is interest in is called, not surprisingly, “Tall Bearded Irises.” They grow from 27 to 41 inches tall. And the spectacular flowers measure from 4 to 7 inches across. Unlike many other perennials, Irises are happy to bloom lavishly over a very wide area of North America. They are hardy into Canada, and are equally beautiful in gardens in places like Dallas, Texas, and even further south. They are famously easy to grow, and are some of the most persistent perennials of all. Like oriental poppies, they will withstand grass, weeds, and other plants, even if a perennial garden is untended for years. You may well see an old garden with almost nothing left but the weeds, and often there, sticking up out of the tough invading grasses and brush are the healthy sword-like leaves on an iris. The Bearded Irises. These are examples of the most popular irises - the large-flowered tall ones that are planted in late summer. 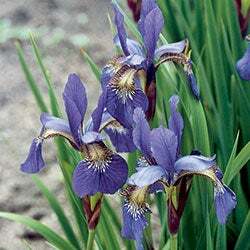 The popularity of these, with thousands of varieties and hybrids available, tend to overshadow the wonderful "Beardless" irises discussed below. Bearded Irises are also called "German Irises." Bearded Irises grow from a root called a rhizome, an enlarged, elongated sort of lumpy bulb-like affair that is often right on the surface of the ground. In fact, Bearded Irises like to have their rhizomes somewhat “exposed,” usually running along like a sausage half buried in the soil. These rhizomes multiply horizontally, forming new sections and finally, a mat of rhizomes from which rise the beautiful fans of leaves and spectacular flowers. Division is Important — and easy. This is another characteristic Bearded Irises share with their blooming companion, oriental poppies. Both must be divided every few years. Both form larger and larger colonies, and as the colonies become thick and leafy, there is less and less bloom. Dividing irises is easy, and should be done after bloom. Simply dig up the whole mass of roots, and cut the rhizomes apart with a sharp knife. Then replant them, either singly, or maybe in small clumps a few inches apart — and transfer your “extras” to other parts of the garden. These newly planted irises will have time to grow and establish themselves for the rest of the summer and fall, and will be ready to bloom for you next spring. An old clump of bearded irises will yield enough tubers to create a whole new garden of irises, if that's what you want. Plant each rhizome or rhizome group with the top of the rhizomes showing atop the soil, and keep the area moist for a few weeks. They'll quickly send down their roots in the new locations. The Rainbow of Varieties grows every year. Today, there are thousands and thousands of Tall Bearded Iris hybrids, with new ones every year. Before World War II, most new hybrids came from Europe, but since, it has been an American passion. 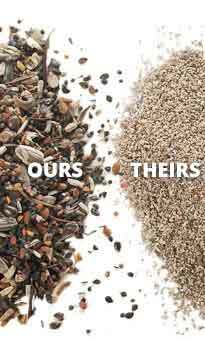 Today, the trade is led by the famous Shreiner's Iris Nursery in Oregon and others. But of course there are other Bearded Iris experts and hybridizers all over the world. First, let's dispel the confusion that surrounds this group: Once they were known as Kaempferi Irises, today many call them "The Butterfly Irises", but the correct common name is simply "Japanese Iris." In luscious colors of purple, pink, and endless bicolors, they have been cultivated in Japan for over 500 years, and were once restricted to enjoyment by royalty only. Though many think they are, they are not water dwellers. They require about the same conditions as ferns, astilbes or impatiens—just moist ground, which most all gardeners can easily provide. As you can see by the photos, these iris blooms are quite different from the tall "stand-up" flowers of the big Bearded Irises. With Japanese Irises, both sets of petals are more flat, forming a simpler, flatter—and many think more beautiful—flower. 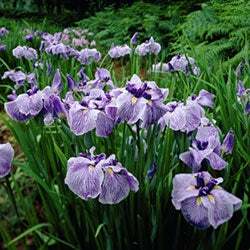 Japanese Irises form large lavish hardy clumps and are highly decorative. They're also great for cutting. This is the iris favored by many landscapers over the Bearded group. And the reason is obvious. 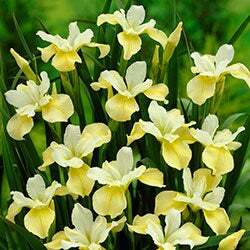 Hardy as oaks, Siberian Irises form very handsome clumps of grass-like foliage with a host of blooms rising on elegantly thin stems. The flowers are smaller than the Bearded Iris blooms, but once they're gone, the foliage of this group remains a highlight in the garden all season long, as decorative as almost any ornamental grass. 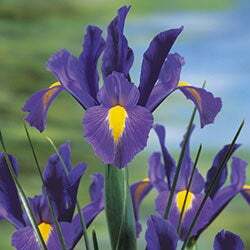 Siberian Iris' hardiness and longevity are also big plusses. Once established, they will grace a garden for generations. There are fewer hybrids here, compared to the Bearded group, but there are now some quite glamorous bi- and tri-colors. Still, purist gardeners usually prefer the classic blue, purple and yellow flowers from this elegant group. They can be planted in spring or fall. One of the most under-used groups in gardening, these magnificent irises are our own native plants'spectacular wildflowers from the bayous and wetlands of the Gulf Coast. The have large flowers, often from 4 to 6 inches across, and a form more like the Japanese type's flatter and wider than the tall up-and-down Bearded Iris bloom. The hybrids of these beauties are often hardy all the way to Canada, so gardeners almost everywhere can enjoy them now. They enjoy conditions similar to the Japanese types, so all you need is a moist area, rich soil, and partial shade. Any well-watered partially-shaded perennial garden will do. This group is world famous for its large flowers and wide palette of coloring, featuring some colors found in no other group. The dark 'Black Gamecock' is known everywhere, and the Louisianas are justly famous for the very dramatic markings, called 'flashes' of gold in their centers, clearly seen in the famous, 'Sinfonietta'. Many of the 'species' or wild irises are among the Spring-Planted beardless group. 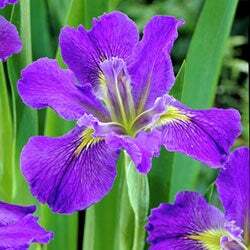 The two best known are our own Wild Iris, 'Blue Flag' so common and loved in the Northeast. And the taller 'Yellow Flag', native to England. The Blue Flag is a perfect plant for your wildflower meadow, or anyplace else in your landscaping where there is plenty of water in spring. They cannot be submerged, but enjoy wet meadow and wet woodland locations. The very strong-growing Yellow Flag is also useful, but be aware that it can be invasive, and end up choking shallow waterways, much like cattails. Be sure it is not considered a pest in your area before planting. The Beardless Group includes pretty much the rest of the irises, and that means several kinds: most importantly Japanese, Siberian, Louisiana, and certain Species (or Wild) Irises. As you can tell by the names, beardless irises occur worldwide. They also require certain growing conditions. 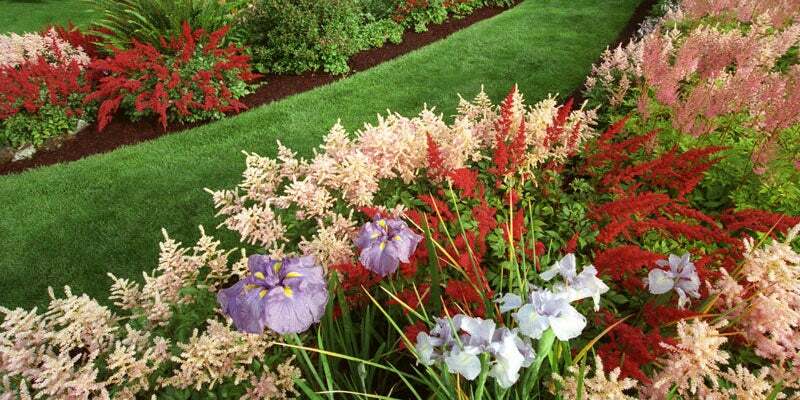 No pond or stream necessary: This photo shows the happy combination of Japanese Irises with astilbes, daylilies and other perennials. No pond or stream in sight. You may have heard that many of the beardless irises are “pond irises” or “water irises”, and that's because many of them can actually grow in shallow water. But that is not a requirement. Certain Japanese Irises, Louisiana Irises, and many of the Wild Irises love moisture, but none of them must be planted actually in the water. If you have a pond or steam, they'll love that location, but most people don't. And all these plants are perfectly happy in a well-watered perennial garden. Just give them locations where they'll get plenty of moisture throughout the season. The one big exception in the group are the Siberians. They like moisture too, but are perfectly happy with normal perennial conditions, and don't resent drying out from time to time. Mulching is important with this group. Since most of them enjoy the same moist, partially-shaded conditions as hostas, ferns, astilbes and impatiens, mulch their roots to help them retain moisture during warm dry periods. Bark chips, peat, or any good moisture-retaining mulch will be a big help. Full sun is ok, too, but no irises should be in blazing hot dry areas. They need no more than the usual feeding, like most flowering perennials. For feeding perennial gardens, my favorite perennial expert, Frederick McGourty, recommends familiarizing yourself with standard perennial flower fertilizers, which are always labeled with three numbers in a sequence, such as 5-10-5 or 5-10-10, or 10-10-10. These numbers on the bag refer to percentages of Nitrogen, Phosphorus and Potassium, in that order. McGourty explains that the most important element here for flowering plants is the middle number, Phosphorus, so he recommends choosing a fertilizer with the middle number no lower than the other two. If your garden is new, try to rake in your fertilizer a week or two before planting. And in later years, one feeding in spring (remove the mulch, and rake it in) should do. If you use dry granular fertilizer, remember to scatter it when the soil is wet and the foliage of your plants is dry. Dry fertilizer sticking to stems and leaves can burn the plants. If you're new to the neighborhood, it's always good to give your local county extension agent a call, and discuss soils and feeding with him or her. That's what they're there for. It's great local advice, and it's free. You'll find the number in the phone book under US Govt, Cooperative Extension Services. These irises have a variable root structure, but all are quite obvious when it comes to dividing. Of course, you may never choose to divide yours. If you're like me, you love large expanding clumps of Siberian Iris, for example. I've never seen the size of the clump interfere with the bloom. And the incredible photo of that purple Japanese Iris at the top of this page proves that an older, larger clump of that iris blooms just beautifully. But you may choose to divide. If you do, just after bloom is a good time, since then your divides will have the season to regrow and prepare for next summer's flowering. As with all dividing, try to keep your clumps large; don't reduce your plant to little bits that will take years to grow back to blooming size. If your iris root is a mass of rhizomes (like Blue Flag will be), simply cut them with a sharp knife, leaving several rhizomes per clump. But most of this group will have a mass of fleshy roots, similar to daylilies. A sharp spade will do the trick, and to disturb the growing plant as little as possible, you may do what I do. For a Siberian for example, don't dig it up. Just sink the spade directly down in the middle of the clump and cut straight through the roots. Then pry up one of the halfs, take it out of the ground, and then fill in the hole. Your undisturbed half will then be very little affected by the whole operation. Then take your removed half, chop it into (large) pieces and plant them. Water before and after all this, and you should have no problems. It's really easy. If your clumps are large, though, it can be heavy work. One of the names says it all: Siberian Irises are as hardy as oaks, and really need no winter cover or care. Blue and Yellow Flags are the same. Japanese Irises are much the same, too but some hybrid varieties may need some winter protection. Louisiana Irises are the ones to watch when it comes to winter hardiness. Since they're from the Gulf Coast area, some are hardy only a few zones north. However, many of the most popular hybrids have been bred for hardiness all the way into Canada. So when you choose yours, check the hardiness of your favorites. These are the florist's favorite, and if you ever order a “Spring Arrangement” from a flower shop, you can bet these will be in there. They're the really beautiful irises on long, thin stems in the familiar blue with the bright flash of yellow, but also in reds, whites, yellows, and bicolors. Whenever you buy tulips or daffodils for fall planting, be sure to also get some "Dutch Iris." They're usually listed in bulb sales under "other bulbs" or "minor bulbs." They're amazingly inexpensive, and you'll love them in spring.